It is a “premiere”, according to President Manfred Rekowski. For the first time in the Evangelical Church in the Rhineland there will be a youth synod. It is taking place on 4-6 January 2019. And what is exceptional is that half of its delegates will be youth and half will come from the regional synod. The three guiding documents that have been submitted to the youth synod give a preview of the topics up for discussion: poverty among youth and in the family, participation and youth work in the church. The youth synod is composed of 50 delegates each from the regional synod and from Evangelical Youth in the Rhineland. Joining them will be ten more youth and young adults sent by local student congregations, regional church schools, and volunteer groups involved in confirmation and ecumenical work. Regional synod – that is the highest governance body of the Evangelical Church in the Rhineland, with 206 voting members. It is meeting directly following the youth synod, also in Bad Neuenahr. Closely connected time-wise and thematically interwoven, the youth synod will explore topics with which the regional synod will be engaging in the coming years. There are two common themes: migration issues on the EU’s borders and new parish forms. 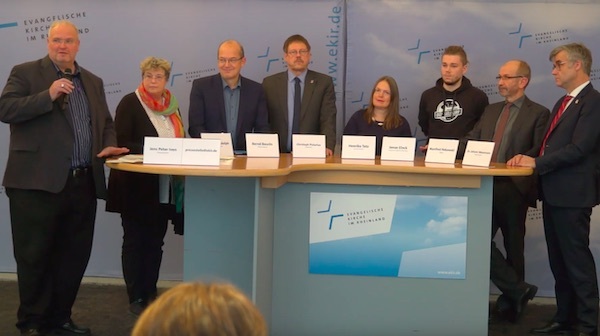 With the youth synod, the Rhineland Church was trying out “new forms of participation,” President Rekowski explained at a press conference held to introduce the 2019 youth and regional synods. While the latest synod of the Evangelical Church in Germany (EKD) made “youth” one of its main themes, here the aim was not to talk about, but rather, with youth. This was unique in the German church landscape, he noted. Henrike Tetz, executive minister for education, called the youth synod “a very strong sign” in the direction of a youth association. She said the parity of the synod’s composition was a clear first sign. Delegates would look at topics together; there would not only be joint discussion but also joint responsibility. And then the regional synod. Here a chapter of church history would be written, announced executive minister Barbara Rudolph, for there would be reconciliation with two churches – in Hongkong and South Africa – which have their origins in Rhineland mission initiatives and which still carry the term “Rhinish” in their names today. The backstory was a “story of wounding,” admitted the head of the Theology Department. Ultimately, the Rhineland Mission had withdrawn from both of these churches over time, they were forgotten. Since September they are members of United in Mission (VEM) again. Thanks to positive economic developments and, consequently, to “favorable developments in the area of income,” the Rhineland Church’s budget appropriation will increase from 714 million euro in the year 2018 to 744 million euro for the coming year 2019, explained executive minister Bernd Baucks, chief financial officer for the Rhineland Church. The regional church budget for 2019 will be submitted to the regional synod as a resolution. An account book will give more detailed explanations. The point was to strengthen innovation, theological vice president Christoph Pistorius explained at the press conference with regard to printed exhibit 22 on new parish forms. The aim was to spur “awakening”, dissolve “obsolete structures” and reach new segments of society, according to the theologian. The new forms of parish are communities in which spirituality takes on a central role. There are already initial examples of this, such as “Beymeister” in Cologne-Mülheim and the “Raumschiff [Spaceship] Ruhr” in Essen. The Evangelical Church in the Rhineland will give stronger support to such parish forms in the future, according to the regional synod exhibit. “Experimental spaces” are to be promoted in particular in the coming ten years. Half a million euro in sponsorship funds are to be earmarked for this work. The grant application foresees a full-time project position to ensure support for and evaluation of activities. “We cannot allow ourselves just to sit back” from what is happening at the borders of the EU, and the situation of people who are fleeing war, environmental catastrophe or economic misery, said judicial vice president Dr Johann Weusmann. Already by the middle of the year 1,500 people on the move drowned in the Mediterranean. The regional synod will – if it follows the proposed resolution – raise its voice “for a humanitarian Europe-wide refugee policy”. Background for the resolution comes from the report on the situation of refugees at the EU’s borders. “The walling-off and demarcation of Europe continues to advance,” the report reads. Human rights and humanity were being generally called into question, political action had the goal of limiting migrants moving into the block. In addition, the salaried church governance member reported on efforts to support what are called “humanitarian corridors” to Italy for refugees in particular need of protection and also to create such pathways to Germany. Secure passage for 500 refugees is what is being discussed in this regard for Germany.